This course was originally taught in the Department of Management Studies at IIT Delhi in September 2017, mainly for MBA students but a diversity of other postgraduate and undergraduate students also participated. It was based on the core text by Tim Unwin (2017) Reclaiming Information and Communication Technologies for Development, Oxford University Press. The use of digital technologies in the learning process. The above links provide access to the outline and reading list for each of these sessions. These resources are made freely and openly available. 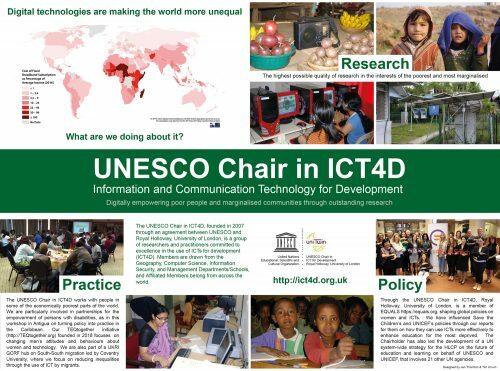 We request, though, that any use made of them is cited as: UNESCO Chair in ICT4D/Author: Tim Unwin/2017.